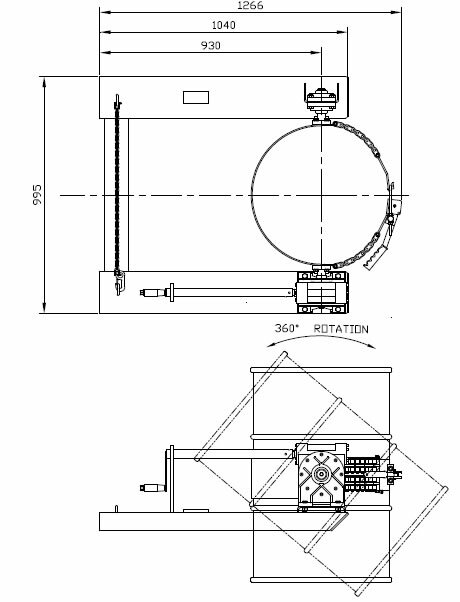 NS-DR-NH forward Drum Rotator with handle operated rotation using minimum effort for fully controlled tipping, allowing complete emptying of the drum contents. 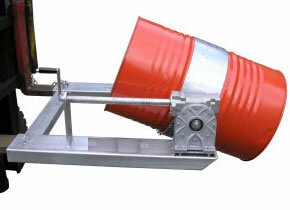 Handle rotation using minimum effort for fully controlled tipping, allowing complete emptying of the drum contents. NS-DR-NC drum rotator features hand chain operation to allow the drum to be rotated when lifted above the chest height of the operator. 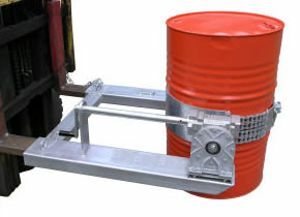 The DC-GR2 Hydraulic Drum Rotator is a heavy duty 205 litre drum lifter with hydraulic grab & 130 degree rotation ability. A 12 volt electric Flow Diverter is fitted to the this unit for use on Forklifts where only one additional valve is available. The DC-GR2/HPP unit is fitted with a self contained battery / electric operated hydraulic power pack, eliminating the need to connect to the hydraulic system of the Forklift. This unique rotator allows for sideways drum rotation without need for hydraulics.